In this video by Dan Lilja, you can see the difference between a factory barrel and a hand-lapped custom barrel with your own eyes. 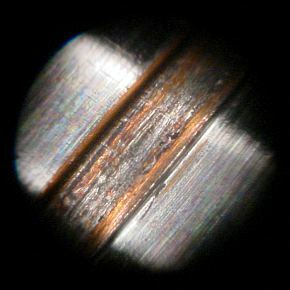 The borescope reveals the tooling marks, rough surface, and flaws in the lands that are not uncommon in a factory barrel. Conversely, the custom barrel (shown in the image below), shows sharp lands, a smooth surface (without excess machining marks), and rifling without scratches or cuts. If you haven’t watched this video before, you may be amazed. 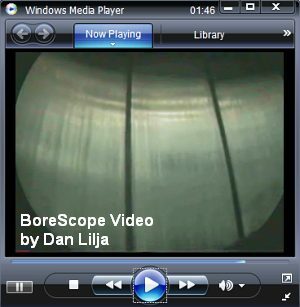 Share the post "BoreScope Video–Factory vs. Custom Barrels"
We find it very interesting that Joe was able to achieve this kind of accuracy with a relatively short barrel. 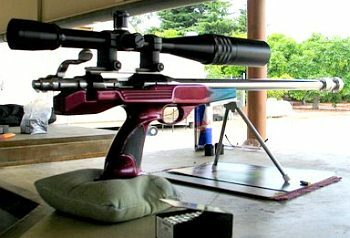 Conventional wisdom (at least with rimfire rifles) dictates that one needs a barrel 25″ or longer to work optimally with the tuner systems. Many folks also believe that the longer barrels tend to “iron out” shot to shot velocity differences. It will be interesting to see if some ARA shooters now experiment with shorter barrels on their rifles. Joe credits much of his recent hot shooting to a new wind indicator product he’s using: “Snuffy” Sail Tails. These use nylon ripstop sailcloth material and maintain a tubular shape (like a long cigar) when attached to a wind flag. They rise and fall with velocity changes, and are much easier to read. Joe says these don’t flutter around like conventional wind tails or surveyors’ tape. They are sensitive enough for small zephyrs but they don’t swing back and forth erratically giving potential false reads. You can order the Sail Tails from Howard “Snuffy” Smith in Macon, GA, (478) 477-2829. A set of five Sail Tails in a PVC tube is $24.50 delivered. Link to Advert. Share the post "Friedrich Shoots ARA 2500 with Calfee Pistol"